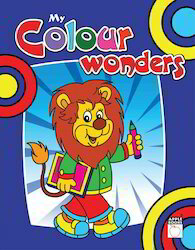 Our range of products include color wonder book, my color wonder -blue, my color wonder - purple books and my color wonder -navy blue. 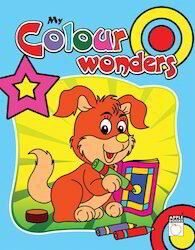 Color Wonder Book offered comes in 16 page softbound finish that is scientifically designed to encourage creativity with use of child friendly illustrations. The fun worksheet reinforces recognition of colors with suggested hands-on activity based worksheet providing for best practical usage. Providing a strong foundation for kid's early learning needs, the options of interesting shapes to color like animals, insects, reptiles, alphabet letters and others and make it suitable for kids of preschool and grade school children. My Color Wonder -Blue book offered comes in 16 page softbound finish and is best suitable for use as a fun time activity. These come with pages on a variety of themes that children can color and is suitable for use by preschool and kindergarten children. Further, the fun worksheet reinforces recognition of colors and help kids develop eye-hand coordination and color concepts. The pages come perfectly designed keeping in mind the needs of youngsters who are just getting started in their initial learning stage. My Color Wonder - Purple book offered comes in 16 page softbound finish with child friendly illustrations that are fun to work with. As best tool for engaging child's interest in Kindergarten and initial school years, the suggested hands-on activity based worksheet help kids develop eye-hand coordination and is suitable for use at home or in the classrooms. It offers a great activity for children who enjoy coloring pages with options of interesting shapes to color like animals, insects, alphabet letters and others. Owing to perfection and quality oriented approach, we have carved niche in the industry by offering My Color Wonder -Navy Blue. 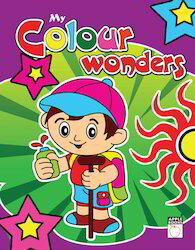 Providing a strong foundation for kid's early learning needs, offered My Color Wonder Books are printed by using the premium grade inks & designed using high quality of paper employing advance machines at vendor’s end. 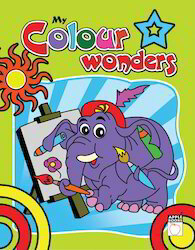 Our valuable customers can avail these My Color Wonder Books from us within a given time frame at affordable rates. Looking for My Colour Wonders ?